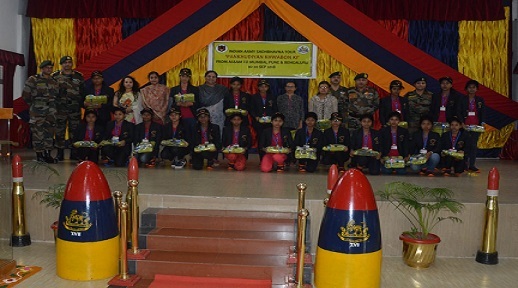 Red Horns Division, under the aegis of Gajraj Corps, flagged off a National Integration Tour for girl students hailing from remote parts of Dhubri and Kokrajhar districts of Assam on Sunday. The tour was flagged off by Amanpreet Kaur Sangha, zonal president of Army Wives Welfare Association (AWWA) of Gajraj Corps. Altogether 20 girl students and two lady teachers will be visiting Mumbai, Pune and Bangalore. They belong to varied ethnic backgrounds from remote areas of Assam. The objective of the tour is to introducing the participants to the rich heritage and culture of the country, increase awareness about educational and professional avenues and building bridges between communities. Amanpreet Kaur Sangha interacted with the enthusiastic girl students and encouraged them to utilise the experience gained during the tour to enhance their knowledge and horizons. The participants also shared their personal objectives and goals set out for the tour with the zonal president of AWWA. As part of the tour, the participants will be visiting places of historical, military, academic, professional, cultural and recreational interests including Gateway of India, Wankhede Stadium, Infosys, National Defence Academy (NDA), Armed Forces Medical College (AFMC), Naval Dockyard, Hindustan Aeronautics Ltd (HAL), heritage centres and museum among others. The participants will also interact with distinguished personalities including the Karnataka governor. The tour will culminate on September 20 with flag in at Dhubri.